Congress, Arizona horse trainer, Twister Heller, uses a training device he calls the "Cowboy Martingale." This martingale is a take off from the German martingale and can be easily and inexpensively made at home. Twister says he uses the cowboy martingale in order to get results without using a great deal of rein pressure. It gives a rider an edge in controlling the horse's head. The first person Twister saw using this apparatus was Ray Hall, a reining horse trainer, from Colburn, Colorado. 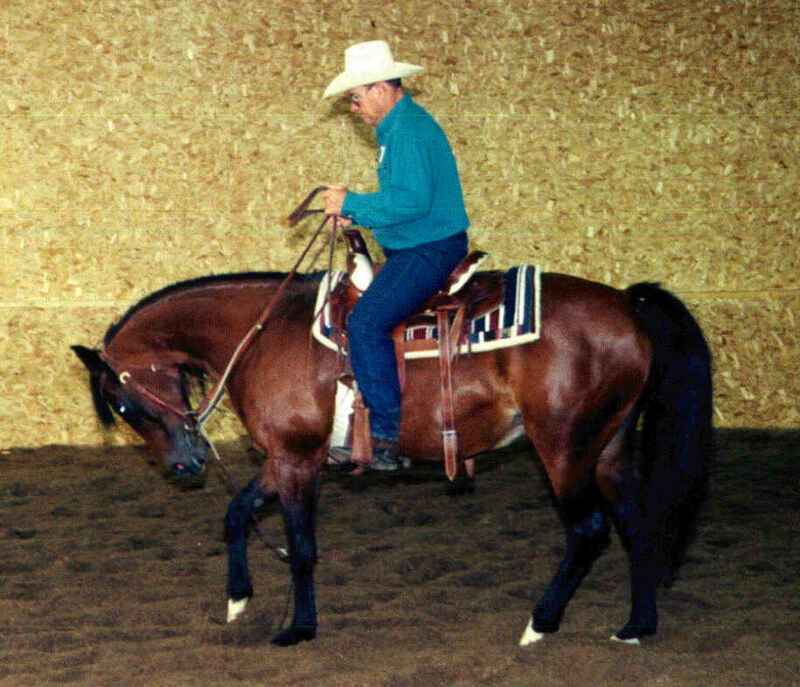 Many martingales have rings that slide on the reins. The cowboy martingale attaches through slits in the split reins and runs through the outside rings of a snaffle bit before attaching to the front cinch. The purpose of this device is not to inhibit forward motion, but helps control extraneous motion such as head throwing, pulling the head away from the rider, shying, bolting, running away, turning back, etc. Obviously, there are specific times and places for its use. The main advantage that the cowboy martingale has over other types of martingales, such as a running martingale, according to Twister, is that the cowboy martingale has more leverage if necessary. The particular pulley effect and the downward angle of the pull usually makes it easier for a horse to understand to put its head down for relief from the pressure. It also helps the rider to develop a soft feel on a horse's mouth because of the way the reins run through the outside O ring on the snaffle. With a running martingale, a rider is back to direct pull, which is fine, but then a rider needs to have more experience and have a more precise feel for the horse. Knowing when to give relief and to feel the resistance is very important. 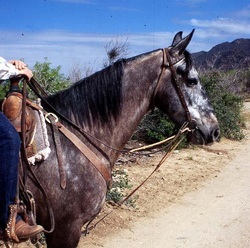 Use of the cowboy martingale will take some of the responsibility off the rider and place it on the horse; however, it does not eliminate the responsibility of the rider to always be aware of what the horse is doing under him. A great many of the horses that Twister works with are horses that have been sent to him for retraining in problem areas or areas that were neglected by earlier trainers. 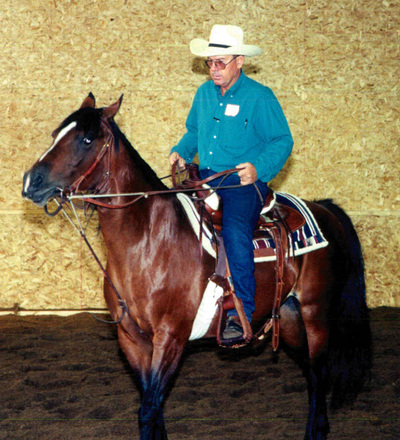 He uses the cowboy martingale on most of these horses. He assesses the areas where training is lacking in a horse and backs up the horse's training to a point where it is easy for the horse to grasp what it is being asked to do. Again the trick is to let the horse think about what is being asked of it. If it can't grasp something, go back to something simpler that it can do. Be aware of what the horse is doing under you. If you are ever in doubt that you are going too far or too fast in one session, you can always come back at another session. Know when to quit. Once you know that a horse understands whatever exercise you are doing, you can become stricter with its performance. Twister likes to start riding a new horse with the martingale adjusted short, to keep the horse under control, for the first 4 or 5 rides and then to loosen it up so that the horse can travel with a natural head set. If the horse tries to stick its nose out, then it will bump the martingale. Care needs to be taken that the horse has enough length to elevate its head enough to be able to turn correctly. Twister cautions against riding with the martingale adjusted too short for too long a period. The rein should be slightly shorter than the martingale so that a horse can learn that if it reacts correctly to the rein, it will not hit the pressure from the martingale. This is very important. Unless you understand this you will defeat the purpose of what the cowboy martingale is designed to do. The martingale is not used to overpower the horse, but to achieve correct head control with less effort from the rider. You are not causing the horse to bend at the poll; it wants to cooperate to avoid the bump of the martingale. After that training has been accomplished and narrowed down to precision work, a rider could then move to a direct rein or possibly a running martingale. As with any training technique, start carefully and recognize what is really happening with the horse under you. To make a cowboy martingale, one of the easiest and cheapest materials to use is braided baling twine. You can also use a number of other materials, for instance, 3/8" soft poly rope. On your bridle, you should use 3/4" wide leather split reins attached to a ring snaffle. Make a 2" slit in each rein about 18" from the ring of the snaffle. You will need a total of about 55" of finished rope for the martingale itself. Make a knot in the ends of the rope so that the martingale can not pull through the slit in the reins, but can be removed for use with another bridle or if you wish to take it off. Attach the rope at its center, with rivets, to a leather strap 32" long. This strap needs a series of adjustment holes up from the free end. These holes allow it to attach to a buckle on another 17" leather section with a buckle on one end and a snap on the other. This strap attaches with the snap to the front cinch ring under the horse's belly, from between the horse's front legs. Below, the horse shows his original resistance to carrying his head properly. After proper adjustment of the martingale and training, the horse bends at the poll and backs up correctly.